Not to be confused with Air Austral. Cielos del Sur S.A., operating as Austral Líneas Aéreas, more commonly known by its shortened name Austral, is a domestic airline of Argentina, the sister company of Aerolíneas Argentinas. It is the second largest domestic scheduled airline in the country, after Aerolíneas Argentinas itself. As a subsidiary of Aerolíneas Argentinas, the company shares its headquarters with that airline, which is located in the Torre Bouchard, San Nicolás, Buenos Aires. Its main base of operations is Aeroparque Jorge Newbery, Buenos Aires. Austral is currently fully integrated into Aerolíneas Argentinas; however, some differences arise, especially those relying upon the Unions the staff of both companies are affiliated to, which lead to constant conflicts. As of October 2013, the airline operates an all-Embraer 190 fleet. The origins of the carrier trace back to 1957, when Compañía Austral de Transportes Aéreos SACI (CATASACI) was founded, starting scheduled services in January 1958 (1958-01). CATASACI focused its services on southwestern Argentina, but it also operated international flights to Montevideo, Puerto Montt and Punta Arenas. Aerotransportes Litoral Argentino (ALA) was a Rosario–based company that was founded in 1957 to operate flights between this city and Buenos Aires using Aero Commander equipment and operated flights within northern Argentina. In 1965, Pan Am acquired a 22% stake in ALA in return for supplying the company with DC-3s. A year later, CATASACI acquired a 30% holding in ALA and the services of both companies were integrated. Douglas DC-6 of Austral at Aeroparque Jorge Newbery in 1972. This aircraft served the airline from 1965. At May 1971 (1971-05), the ALA fleet consisted of two C-46s, five DC-3s, two DC-6Bs and five YS-11A-300s that served a domestic network including Buenos Aires, Corrientes, Formosa, Goya, Paraná, Paso de los Libres, Posadas, Resistencia, Rosario, Salta, Santa Fe and Tucumán, plus regional services to Antofagasta and Asunción, whereas CATASACI had a fleet that included seven BAC One-Elevens —four 400s and three 500s—, one C-46, one DC-6 and three YS-11s. Austral Líneas Aéreas was formally established in June that year from the merger of CATASACI and ALA. In practice, operations of the latter airline were absorbed by CATASACI, which was rebranded as Austral Líneas Aéreas S.A. after merging. 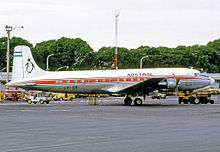 Austral inherited both companies' fleet, consisting of turboprops NAMC YS-11 and jetliners BAC One-Eleven. Austral became a government-owned company in 1980. After poor economic performances, there were two failed attempts to re-privatise Austral in 1981 and 1983. All that time Austral and Aerolíneas Argentinas were competitors on a number of domestic routes. Realizing that such a situation could not persist much longer, the government decided again to privatise Austral. This was much resisted by the Aerolíneas Argentinas' personnel, and more specifically its pilots, who claimed their salaries were lower than those of Austral's counterparts. Aerolíneas Argentinas' pilots union understood the government effort was not to solve their affiliates salary conflict, but to focus on privatising a loss-making carrier as Austral was instead. The consequence of this discrepance was the announcement that Aerolíneas Argentinas flights were to be indefinitely suspended effective 1 July 1986. The strike affected both Aerolineas Argentinas' domestic and international operations. Argentine as well as foreign carriers were benefited from this strike. Ironically, Austral was included among that carriers, gaining the domestic market share Aerolíneas Argentinas lost. Austral became once again a privately owned firm when it was acquired by the holding company Cielos del Sur S.A. in late 1987. The acquisition generated some controversy on the Argentine aviation sector at that time, as it was raised that the new owner had little or no experience in managing an airline. On April 1988, the carrier became an IATA member. 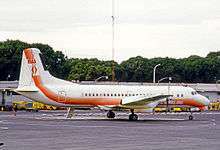 Shortly afterwards, the company faced a major accident during its new private era on 12 June 1988, when a McDonnell Douglas MD-81 hit a tree on a low visibility approach into Posadas and crashed. Apart from the 22 fatalities involved in the accident, it also spread concerns on the aviation sector over the airline's poor rate of occupation on some routes, of just 10.32% for this particular flight. Cielos del Sur S.A. and Iberia formed a consortium to acquire an 85% stake in Aerolíneas Argentinas in 1990, within the framework of that flag carrier privatisation. Soon afterwards, Cielos del Sur S.A. sold Austral to Iberia. The destiny of both Aerolíneas Argentinas and Austral became aligned thereafter. By July 1998, the company was 10% owned by its erstwhile competitor Aerolíneas Argentinas. On 21 July 2008 the Argentine Government took the airline back into state control after acquiring 99.4% of the share capital for an undisclosed price. The remaining 0.6% continues to be owned by the company's employees. In September 2008, Argentina's Senate approved the nationalization of Aerolíneas Argentinas and its subsidiary Austral Líneas Aéreas on a 46–21 vote in favor of the takeover. In June 2010 (2010-06) Aerolíneas Argentinas launched a new paint scheme to revamp the airline's image. 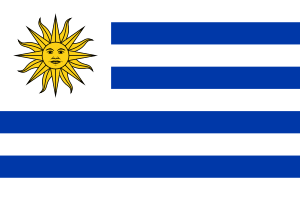 The new livery resembles the colour blue of Argentina's flag and the colour yellow of the sun. As its subsidiary airline, Austral also adopted the new image. Austral's livery actually differs from the Aerolíneas Argentinas' one by a red cheatline only. In the meantime the airline also announced the incorporation of 20 new Embraer 190 to its fleet, receiving the first two of them in September 2010. An Austral Líneas Aéreas Embraer 190 on the apron at Benjamín Matienzo International Airport in 2012. Austral Líneas Aéreas underwent a major fleet renewal. In 2009, the company signed a contract with Embraer for the purchase of 20 Embraer 190s, in a deal worth US$600 million that was 85% financed by BNDES. Two more E-190s were ordered in April 2013 (2013-04); the first of these two aircraft was incorporated into the fleet in September 2013 (2013-09). An Austral BAC One-Eleven taxiing at Aeroparque Jorge Newbery in 1993. This livery was used while the carrier was owned by Cielos del Sur S.A., and persisted for some years after the airline was acquired by Iberia. As of December 2011, Aviation Safety Network records 11 accidents/incidents for Austral Líneas Aéreas, totalling 224 deaths. The list below includes hull-loss accidents only. ↑ A discrepancy exists regarding the death toll, as it was claimed it rose to 30, or to 31. ↑ David Knibb (20 August 2009). "Unions gain in Aerolineas reshuffle". Flightglobal.com. Seattle. Airline Business. Archived from the original on 24 April 2012. Retrieved 24 April 2012. ↑ Brendan Sobie (21 April 2010). "New life for Aerolineas Argentinas?". Flightglobal.com. Washington D.C. Airline Business. Archived from the original on 24 April 2012. Retrieved 24 April 2012. ↑ "Aerolineas Argentinas continues to struggle as government protection from competition increases". Centre for Aviation. 3 January 2012. Archived from the original on 21 April 2012. Retrieved 25 April 2012. Aerolineas is now close to completing a rejuvenation of its entire narrowbody fleet, focussing on Boeing 737NGs at its mainline operation and E190s at its Austral subsidiary. ↑ "Argentina's government buys back flag carrier Aerolineas Argentinas from private firm". DHS Aviation. 5 September 2008. Archived from the original on 24 April 2012. Retrieved 24 April 2012. ↑ Luis Ceriotto (5 March 2011). "Una historia marcada por internas gremiales y una larga puja con el Gobierno" [A history marked by internal union conflicts and a long struggle with the Government]. Clarín (in Spanish). Archived from the original on 25 April 2012. Retrieved 25 April 2012. ↑ "La pelea entre los gremios aeronáuticos, en el límite de lo inhumano" [Tensions between unions bordering unhuman limits]. infobae.com (in Spanish). 4 March 2011. Archived from the original on 24 April 2012. Retrieved 24 April 2012. ↑ "Tras un día complicado, un paro de pilotos obliga a cancelar vuelos en Ezeiza" [Pilots strike force the cancellation of flights at Ezeiza after a complicated day]. Clarín (in Spanish). 4 November 2010. Archived from the original on 25 April 2012. Retrieved 25 April 2012. 1 2 3 "World Airline Directory – Austral Lineas Aéreas (ALA)". Flight International. 135 (4158): 59. 1 April 1989. ISSN 0015-3710. Archived from the original on 24 April 2012. 1 2 3 "World Airlines 1970 – Austral (Compania Argentina de Transportes Aereos SACI)". Flight International. 97 (3185): 473. 26 March 1970. Archived from the original on 24 April 2012. ↑ "World Airline Survey – Aerotransportes Litoral Argentino SA (ALA)". Flight International. 89 (2979): 595. 14 April 1966. Archived from the original on 26 April 2012. ↑ "The World's Airlines... – Aerotransportes Litoral Argentino SA —ALA". Flight International. 81 (2770): 551. 12 April 1962. Archived from the original on 26 April 2012. ↑ "World Airline Directory – Austral Lineas Aéreas (ALA)". Flight International. 105 (3393): 22. 21 March 1974. Archived from the original on 21 September 2013. ↑ "World airlines – Aerotransportes Litoral Argentino SA (ALA)". Flight International. 99 (3243): 610. 6 May 1971. Archived from the original on 16 September 2013. "World airlines – Austral (Compania Argentina de Transportes Aereos SACI) (page 618)". Flight International. 99 (3243). 6 May 1971. Archived from the original on 16 September 2013. "World airlines – Austral (Compania Argentina de Transportes Aereos SACI) (page 619)". Flight International. Archived from the original on 16 September 2013. ↑ "Argentine airlines face reorganisation". Flight International: 7. 19 July 1986. Archived from the original on 25 April 2012. Retrieved 25 April 2012. Argentina's flag carrier, Aerolineas Argentinas, has dismissed all 561 of its pilots after they went on indefinite strike on July 1. ↑ "La Gran Huelga" [The large strike] (PDF) (in Spanish). Archived (PDF) from the original on 24 April 2012. Retrieved 24 April 2012. ↑ Mabel Thwaites Rey (3 June 2001). "Crónica de una década que dejó a Aerolíneas al borde de la quiebra" [Chronicle of a decade that left Aerolíneas on the brink of bankruptcy]. Clarín (in Spanish). Archived from the original on 25 April 2012. Retrieved 25 April 2012. ↑ "Iberia takes control of Argentine carrier" (PDF). Flight International. 31 July 1990. Archived from the original on 24 April 2012. Retrieved 24 April 2012. Concern had been expressed during the tender period that if the Iberia consortium was successful it would monopolise domestic routes. One of Iberia's main partners, Cielos del Sur, owns Austral, Argentina's largest private domestic airline. ↑ "Airline Ownership Survey". Flightglobal.com. Airline Business. 1 July 1998. Archived from the original on 24 April 2012. Retrieved 24 April 2012. ↑ Robert Plummer (22 July 2008). "Argentine airline set for bumpy ride". BBC News. Archived from the original on 24 April 2012. Retrieved 24 April 2012. ↑ "Other News – 09/04/2008". Air Transport World. 5 September 2008. Archived from the original on 24 April 2012. Retrieved 24 April 2012. Argentine Senate authorized the renationalization of Aerolineas Argentinas by a 46–21 vote. ↑ "PHOTOS: Aerolíneas Argentinas reveals new corporate image". Flightglobal.com. 11 June 2010. Archived from the original on 24 April 2012. Retrieved 24 April 2012. ↑ "New directions, new image" (PDF). p. 10. Archived (PDF) from the original on 24 April 2012. Retrieved 24 April 2012. ↑ Diego Dominelli (16 September 2010). "Llega el primer avión para Austral" [First (Embraer) plane arrives for Austral]. Radio Nacional (Argentina) (in Spanish). Archived from the original on 30 September 2010. Retrieved 10 March 2011. ↑ Kirby, Mary (8 July 2009). "UPDATE: Embraer's 1H deliveries nearly reach year-earlier tally". Philadelphia: Flightglobal. Archived from the original on 15 April 2012. Retrieved 15 April 2012. Embraer also signed a contract with Argentina's Austral Lineas Aereas for the sale of 20 E-190s. ↑ "Austral Lineas Aereas inks deal for 20 E-190s". Air Transport World. 25 May 2009. Archived from the original on 15 April 2012. Retrieved 15 April 2012. ↑ "Embraer To Sell 20 Jets To Argentina's Austral". Airwise News. Reuters. 22 May 2009. Archived from the original on 15 April 2012. Retrieved 15 April 2012. ↑ Straus, Brian (22 June 2009). "National carriers, fleet renewal matter of 'national dignity' in Argentina". Air Transport World. Archived from the original on 1 December 2012. Retrieved 1 December 2012. ↑ Pereira Lima, Edvaldo (9 April 2013). "Austral Lineas Aereas orders two Embraer E-190s". Air Transport World. Archived from the original on 11 April 2013. ↑ "Austral orders two more E-190s". Flightglobal. 8 April 2013. Archived from the original on 19 March 2014. ↑ ""Aerolíneas creció un 88% desde el 2008 y el objetivo es crecer un 20% más por año", resaltó Recalde". Télam. 27 September 2013. Archived from the original on 24 June 2014. ↑ "SubFleets for: Austral Lineas Aéreas". AeroTransport Data Bank. 11 April 2013. Archived from the original on 11 April 2013. ↑ "No more tears". Flightglobal.com. Airline Business. 1 October 1997. Archived from the original on 26 April 2012. Retrieved 26 April 2012. 1 2 Bonnassies, Olivier (28 February 2013). "Aerolineas and Austral to sell MD-80 fleet". London: Flightglobal. Archived from the original on 21 December 2014. According to the tender, Austral's fleet includes a 1988-vintage MD-81 aircraft (MSN 48025), along with two 1989-vintage MD-83 aircraft (MSNs 49630 and 49784) and two 1990-vintage MD-83 aircraft (MSNs 49906 and 49934). 1 2 "Austral Fleet". Airfleets.net. Archived from the original on 15 April 2012. Retrieved 15 April 2012. ↑ "Accident record for Austral Líneas Aéreas". Aviation Safety Network. 21 December 2011. Retrieved 23 December 2011. ↑ Accident description for LV-GED at the Aviation Safety Network. Retrieved on 23 December 2011. ↑ Accident description for LV-GEB at the Aviation Safety Network. Retrieved on 23 December 2011. ↑ Accident description at the Aviation Safety Network. Retrieved on 23 December 2011. ↑ Accident description for LV-JGY at the Aviation Safety Network. Retrieved on 23 December 2011. 1 2 "Safety: commercial half-year report – Fatal accidents: scheduled passenger flights" (PDF). Flight International: 172. 18 July 1981. Archived from the original on 26 April 2012. Retrieved 26 April 2012. 1 2 Accident description for LV-LOX at the Aviation Safety Network. Retrieved on 5 August 2011. ↑ Accident description for N1003G at the Aviation Safety Network. Retrieved on 23 December 2011. ↑ "Commercial flight safety – Fatal accidents: scheduled passenger flights" (PDF). Flight International: 51. 21 January 1989. Archived from the original on 26 April 2012. Retrieved 26 April 2012. ↑ Accident description for LV-WEG at the Aviation Safety Network. Retrieved on 23 December 2011. ↑ "75 Die in Crash of Argentine Plane in Uruguay". The New York Times. 12 October 1997. Archived from the original on 26 April 2012. Retrieved 26 April 2012. Wikimedia Commons has media related to Austral Líneas Aéreas.